Our Koi Auctions are one of the highlights of our calendar. They are a great opportunity to buy beautiful koi at reasonable prices in good health. 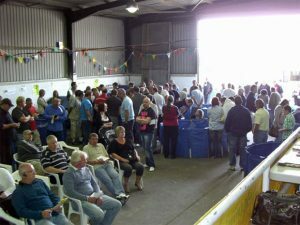 There are usually about 250 ‘lots’ for sale at each auction and they range from large to small koi at prices to suit all pockets, depending on the popularity of the ‘lot’. Each Koi for sale has been ‘benched’ by our expert team for size and variety. All koi on sale are from members ponds, you have to be a member to sell but buying is open to anyone, just get a bidding card and you are on the way to enjoying some beautiful koi. As with all our events Koi health is paramount to the running of this event. As a BKKS section we maintain the highest standards in line with current guidelines. All buyers are provided with strong cardboard boxes to transport the koi safely. All we ask you to do is make sure you have enough space to fit them in for a safe journey to their new homes……your ponds. Coming soon, preview pictures of some of the koi for auction.